Our campaign aired its first television spot, “Overcome,” Thursday night during the University of Nevada’s Sweet Sixteen game in the Reno and Las Vegas media markets. This ad comes just one week after Adam officially filed to run for Governor of Nevada. 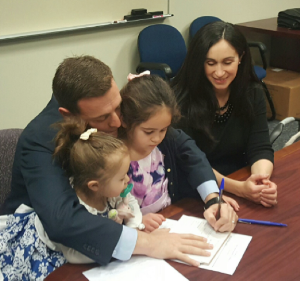 Adam was joined by his wife Jaime, daughters Sophia and Isabella, and his newborn son, John Dominic. 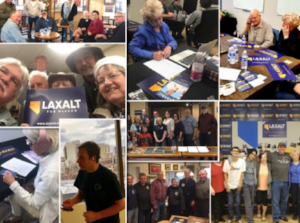 Later that day, over 200 supporters gathered at homes across the state for the very first “Laxalt Day,” to make more than 2,000 phone calls for Adam and discuss his campaign with their friends, family, and neighbors. With less than three months to go before Nevada’s June 12 primary elections, not only are we the first out of the gate with a positive narrative about our candidate, but the numbers also show that our campaign is building strong grassroots momentum throughout the Silver State. Nearly 3,000 Nevadans have already signed up to volunteer for the campaign and we recently reported having more small-dollar donors than any candidate — Republican or Democrat — running for Governor combined, comprised of donors from every county in the state. This is a grassroots movement that we will continue to grow in the weeks ahead. Confidence among small business owners is at a record high, according to a recent CNBC survey. The good humor is due, in part, to the half of them who expect positive change to come from the new tax law in 2018. Positive change is already happening: Wells Fargo and U.S. Bancorp are two of many institutions raising their starting pay to $15 an hour. I’m from Nevada, and Las Vegas’ own South Point Hotel, Casino, and Spa doubled its employee bonuses and canceled a scheduled increase in health insurance costs as a result of the tax cuts. All told, Americans for Tax Reform reports that more than 4 million U.S. workers are receiving bonuses, wage increases, or better benefits thanks to the new tax law. But if you exclusively listen to the overarching narrative from the political left, it seems tax cuts benefit only large corporations at the expense of the American middle class. As for the rest of us? Any benefits we see are mere “crumbs,” according to House Minority Leader Nancy Pelosi, the 15th-wealthiest member of Congress. I’ll give Democrats credit for getting half the story right: Businesses are benefiting from the new tax law, but not to the exclusion of working America. Tick Segerblom’s plan to raise the county sales tax by a full percentage point finally makes sense: He is operating under the catastrophically flawed assumption that education spending is at an all-time low, when precisely the opposite is true. If that were true, his desire to increase education spending with another tax hike might be understandable. But he couldn’t be more wrong. As the Review-Journal reported in December, per-pupil, inflation-adjusted funding for the Clark County School District has increased by 66 percent since 1967 — and that’s just looking at base funding received from the state Distributive School Account. In addition to base funding, Nevada taxpayers contribute hundreds of millions of dollars more in “categorical” funds — supplemental funds used for specific educational purposes such as reducing class-size, helping low-income students and so forth. Federal data from the National Center for Education Statistics shed light on the full scope of Nevada’s education spending: From 1960 to 2015, Nevada nearly tripled the amount spent on K-12 education, as inflation-adjusted, per-pupil expenditures rose from $3,556 to $9,165. In total, Nevada spent approximately $4 billion on K-12 education in 2015 — the most recent year data were available from the center. That number would have to have been $1.5 billion or less in order for Mr. Segerblom’s claim to be true. In other words, Mr. Segerblom appears to be operating under the assumption that $2.5 billion in annual education funding doesn’t exist! While it’s obviously inexcusable for a lawmaker pushing for a tax hike to get his facts so wrong, it’s understandable that, given their continual struggles, some would assume our schools are chronically under-funded. But those struggles — stagnant test scores and declining graduation rates — have occurred despite generations of sustained spending increases. Sadly, Nevada’s experience is just part of a much larger trend. On a national basis, the overall performance of K-12 schools has remained flat since 1970 despite a nearly 200 percent increase in inflation-adjusted per-pupil spending over that same time period. Choice and competition improve virtually every aspect of our lives. There is absolutely no basis to support the notion that a top-down monopoly is the best way to deliver education — which is, after all, arguably the most unique and customizable service imaginable. Former state Sen. Mark Manendo sexually harassed more than a dozen women over his years in the Nevada Legislature, leading to his resignation. The transgressions were documented in a $67,000 taxpayer-funded investigation, but the public can’t see the report. Former Henderson Police Chief Patrick Moers retired with full severance benefits after a law firm hired by the city found he repeatedly sexually harassed at least one employee. The city has declared that report, paid for by city taxpayers, confidential and unavailable for public scrutiny. In trying to come up with ways to tackle Nevada’s soaring pension debt, a key Nevada legislator put forth an idea that is the functional equivalent of trying to put out a fire by dousing it with gasoline. At last week’s Interim Retirement and Benefits Committee legislative hearing, Assemblywoman and Committee Chair Maggie Carlton made it a point to declare that increasing wages for government workers was a viable way to reduce Nevada’s pension debt. At the outset, it’s important to remember that the only reason PERS $13 billion unfunded liability matters is because of the massive burden it imposes on the government workers and taxpayers who must pay down this debt. But it’s actually even worse than that. Because higher wages translate to higher future pension benefits, Nevada governments and taxpayers would get billed twice: as the cost of higher wages is compounded by higher annual pension costs. So what, if any, reduction in PERS unfunded liability would occur in exchange for increasing both the annual wage and retirement costs of Nevada governments? Literally, zero dollars — and that’s in the best-case scenario. But more on that later. Carlton’s genuinely too-good-to-be-true proposal came in response to a presentation by PERS executive officer Tina Leiss. Leiss was discussing the result of payroll growth having been far below what the System assumed over the past 10 years. And because PERS sets annual contributions as a percentage of payroll — rather than a level-dollar amount — the lower-than-assumed payroll growth means debt payments coming in below forecasts, which in turn requires levying higher contribution rates on public employees in order to ensure the full, expected dollar amounts are received. The state of Nevada refuses to divulge how much it has paid former employees for their unused sick and vacation leave. Since October, the Las Vegas Review-Journal has sought comprehensive information documenting how much money individual employees received when they retired, resigned or were fired. The request, if fulfilled in its entirety, would encompass employees spanning from department executives to rank-and-file workers such as DMV clerks.